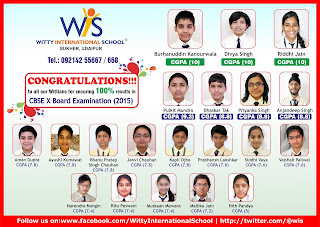 Wittians rock once again ...100 % result in CBSE X Examination 2015. On Friday 17th April 2015 the little wittians of Nursery at Witty Kids Shastri Nagar Bhilwara celebrated Favourite Toy day with enthusiasm. Children were excited to see their decorated class with various toy objects. Kids brought their favourite toys like toys, books, crayons with them. Children learnt that we should share our things with others. 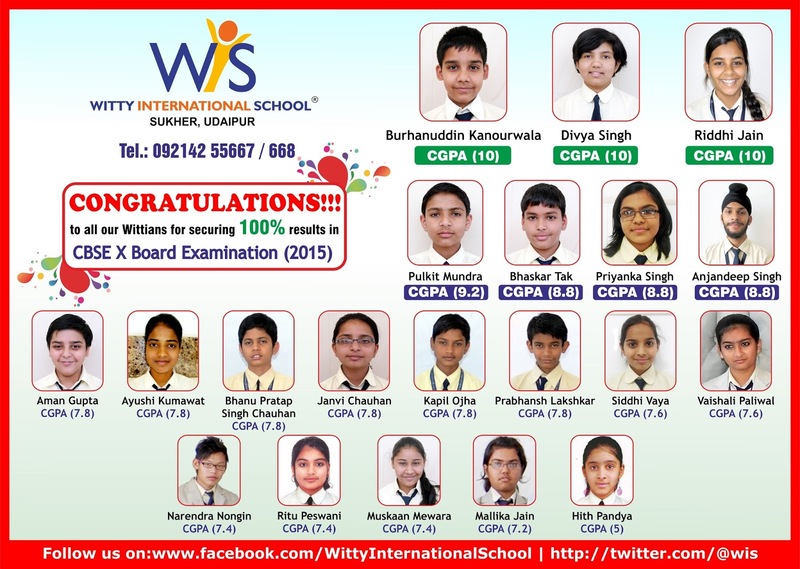 The Little inventors of Jr. KG at Witty Kids Shastri Nagar , Bhilwara discovered their various senses of taste, smell, touch ,sight and hear on May 1’ 2015. Teacher arranged various materials for the experimental day. GUSTATORY -Children were given various things to taste of same kind but have different taste like potato and apple , salt and sugar .They were told that taste and smell work together . OLFACTORY- Children came to know about the sense of smell with the help of water and vinegar which look same but taste and smell different . Teacher did recap of sense of sight through practical examples. Children enjoyed clapping pattern activity, playing drums and heard various sounds and came to know about sense of hearing. Children enjoyed searching the place from where the fragrance is coming and tested their sense of smell. They also tested their sense of sight with the help of more experiments. Through all these activities children identified their various sense organs and their work. 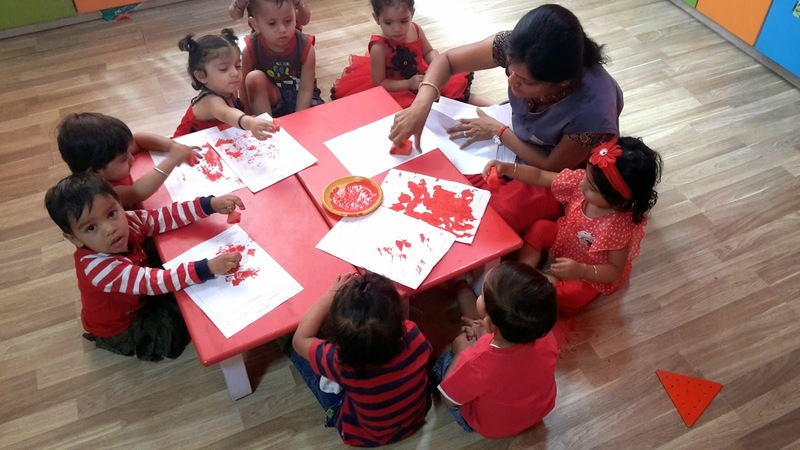 The little ones of Playgroup to Jr. KG at Witty kids, Shastri Nagar Bhilwara came along with their swimming costumes from Thursday, April 23’2015 to Thursday, April 30’2015 to enjoy water play activity. Children were filled with joy to play in water during these hot days. Kids came to know that they feel cool after taking a water bath. Children also brought summer snacks like watermelon, mango, salads, drinks and shakes. They were told that these things are good to be eaten during summers. Children felt refreshed after splashing water. In this hot summer season the little wittians of Nursery and Jr.KG at Witty kids Shastri Nagar,Bhilwara had a field trip to ‘Fun Republic’ ice cream parlour on April 21 and April 23 ,2015. The little ones were very excited to go to one of their favourite place i.e the ice cream parlour. They were told about the different tastes and flavours, we get in ice creams. 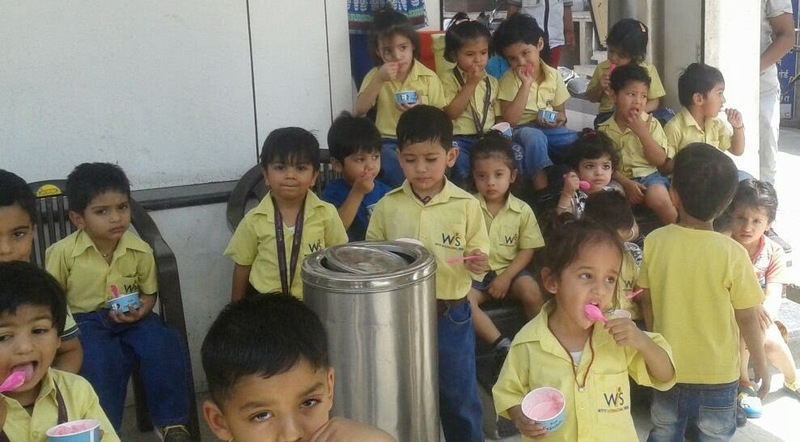 Children came to know that we eat ice cream in summer season and ice creams are to be kept in freezers to keep them cold and prevent from melting. 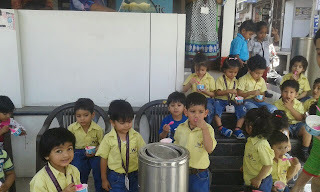 Children also ate ice creams of their favourite flavours and were filled with zeal. 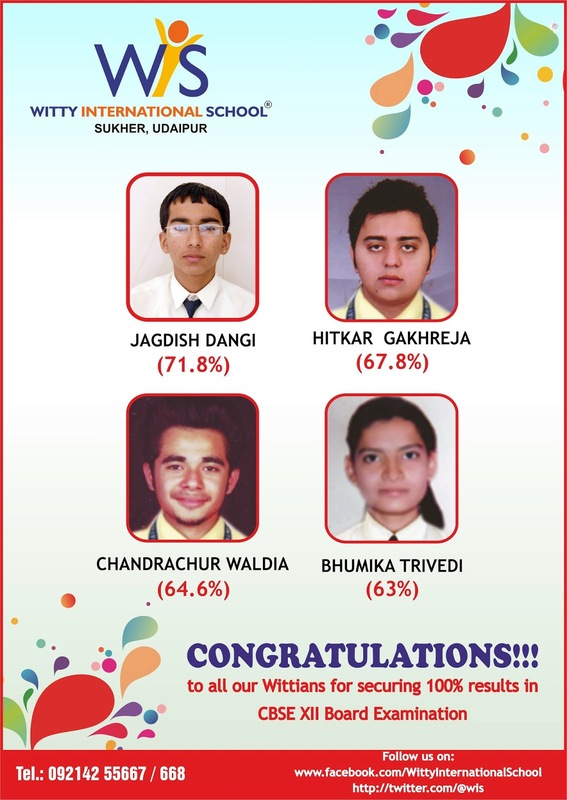 With the aim of honing the dancing skills of the students, an Inter House Group Dance Competition was organised in Witty international School, Udaipur on 8-5-2015. The theme of the competition was "Unity in diversity". The vivacious dancers set the floor on fire with their energetic performances. The fun filled extravaganza offered folk dance forms of Haryana, Punjab, Bengal and Gujrat. The spectators witnessed the enthusiasm and energy of the young Wittians as they enthralled everyone with their performances. The adjudicators Director Mrs. Preeti Sogani, Principal Mrs. Shubha Govil and the special guest from Mumbai Ms. Preksha Jain highly complimented the efforts put in by all the four houses. In the closely contested competition, in Junior group Ruby house bagged 1st position whereas in Senior group, Topaz house bagged 1st position, followed by sapphire Emerald and Ruby. Swimming Camp was organized for Wittians of Grade III to VII wherein they participated enthusiastically from 28th April, 2015 at Khel Gaon, Maharana Pratap International Stadium. They were taught basic Swimming strokes under the vigilance of a trained coaches. Many Students were shortlisted for advanced training. They actively and excitedly participated in this activity. This activity helped them to enhance their activity. This activity helped them to enhance their confidence and maintain their fitness. My guardian angel from above. Mother’s Day is a celebration of bond of love and affection between a mother and a child and it celebrates the spirit of motherhood. Bringing up a child through giving birth, and helping him or her growing up into an adult is considered to be the essence of motherhood. It is a challenge in itself, as she has to go through countless hardships in the process. Mother’s Day is an occasion where the child and society remembers and acknowledges the essence and the effort that goes into giving birth and rearing a new life. This is a special day for children as well as for the mothers and they get an opportunity to relish the everlasting bond of love and affection between them. To thank and respect this dedication and selfless love, Wittians at Bhilwara celebrated Mother’s day with a pledge that they should always care of their mothers. Information about this day was given to the students. A poem was dedicated by the students to their mothers. All Wittians took resolution that they will tell their mother how special they are for them and obey their mothers throughout the life. Water play offers endless enjoyment to both adults and children of all ages, whether they are in a warm winter bath or a cool summer pool, most kids love water play. It's a different experience as children feel the water, hear the splashes and sprinkles, see the bubbles and waves, and may be even taste a few droplets. Water play activity days were organized for the Pre- Primary section from April 21 to April 30, 2015. It was a pleasure to watch the tiny tots splashing and screaming. Children were made to wear their swimming costumes and were taken to the mini pool. The objective of the water play was to develop their physical skills and advance their social and emotional skills. The children enthusiastically participated in the water play activity and enjoyed dancing with their friends. It was the fun filled time for the toddlers. 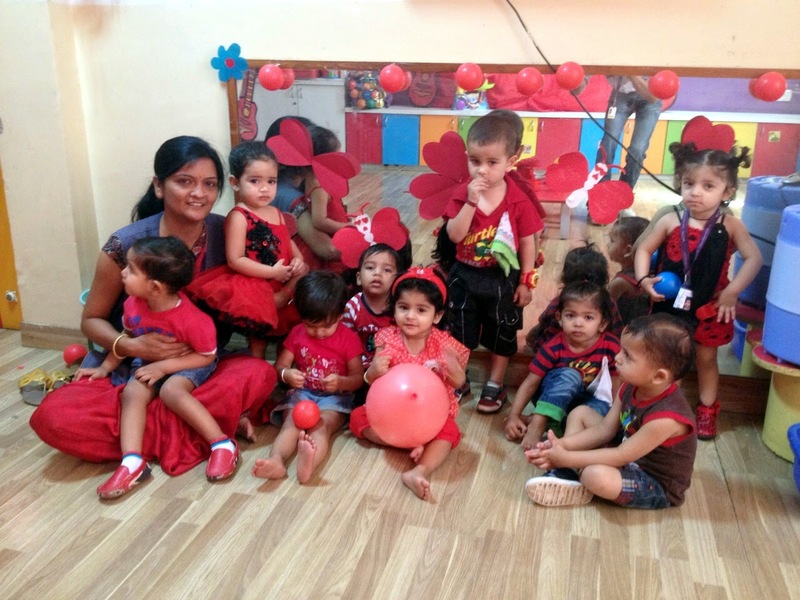 The Toddlers of play group celebrated Red colour day on Friday, April' 24, 2015 with lot of exciting activities. The entire class room was decorated with red color objects. 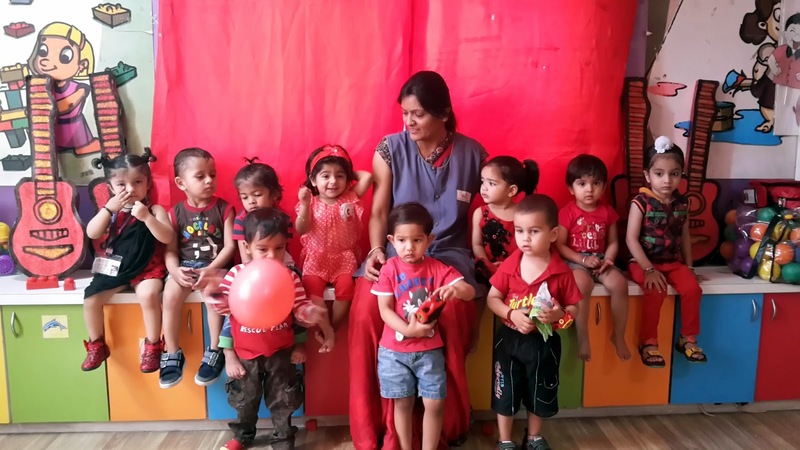 The tiny tots and their teacher came to school in red colored clothes and kids brought their favourite red color objects such as ball, car and shape hut, etc. The kids sorted the red balls .The little ones did the sponge dabbing of red color on witty art worksheet. The little buddies could recognize the red color in an interesting way.